Do you know that in Polish language we have about 10 different names for potatoes? Travelling around Poland you can find even the monuments of it! To prove that potato is an unusual vegetable we invite you for an unforgettable trip to Radom Countryside Museum, where we will take part in the Potato Festival. During the festival you will see traditional farm works on a real Polish countryside, as well as listen to live music, performed by folk bands. You may also take part in many different competitions, art and craft workshops as well as purchase hand-made decorations at the local bazaar. On the way back we will visit Przykory – picturesque village, situated in the valley of the Jeziorka river (one of the cleanest in Poland!). In peaceful ranch we will ride a real horse-drawn carriage or try horse riding (for those who want to). Starting time: 30 September, 9.00 a.m.
Transportation, tour leader, entrance fees and ride a carriage are included in the price. 11.00 – Arrival to Radom, visit in the Museum. Those who want to, will take part in the farm works, art and craft workshops. Free time for lunch. 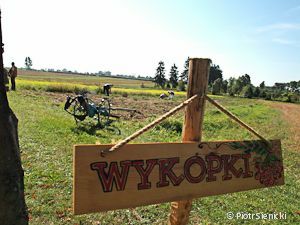 16.00 – Arrival to Przykory, a horse-drawn carriage ride around beautiful region and horse riding.